Obama has tiptoed around the image of him as the first African American president, clearly believing that raising the racial issue makes for more animosity for him from opponents. He is right in that, there is a real question of whether blacks are all that better off under him than other recent presidents. 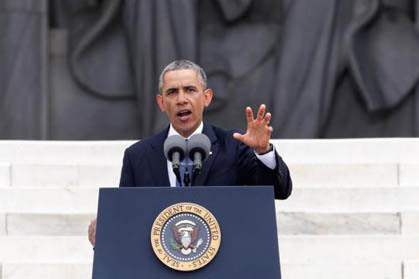 It was instructive to see Obama speak literally in the shadow of the Lincoln Memorial. Lincoln too was hesitant in his day to acknowledge the extraordinary burden of slavery on black people until he eventually emerged with the breathtaking emancipation proclamation. Obama does not have the rhetorical gifts or political crisis to handle what Lincoln, our most tried president, had to deal with. But Obama has come nowhere close. But he has been remarkably silent on race which is one of the great issues of our day - we only have to look at the Trayvon Martin case to prove that. What would an honest speech by President Obama look like? It would confront issues in the black community too, such as the extraordinary rate of black on black violence, the impact of fatherless families, the constant seeking of political victimization. On the other hand addressing the virulent racism dressed up as political truth telling, especially from the right, would surely lead to more honest discourse. The need for honest and open discourse between the races has never been more obvious and the president must lead that debate. He is in a unique position to make that happen. He is well into his second term and his legacy remains unfinished. Alas the speech he made yesterday was not it.